Protesters in front of the Marketing Suite in October 2018. 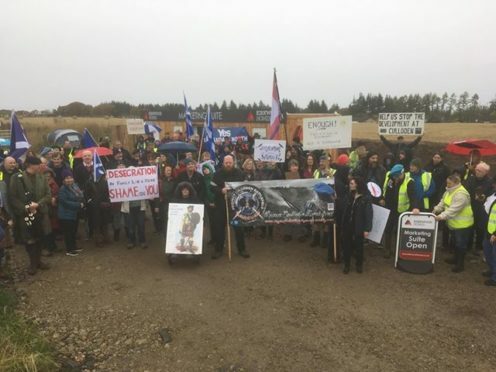 Furious locals and councillors have blasted a housing developer for putting up a sales office for its controversial development near Culloden Moor without planning permission – and leaving it there after planning permission was refused. Kirkwood Homes’ sales office is for its 16-home Viewhill development, within the Culloden Moor Conservation Area and some 300 yards to the north east of the famous battlefield. The development had a fraught passage to final planning approval, amid vigorous campaigning from around the world by those keen to preserve and protect the battle site. Inverurie-based Kirkwood placed the temporary portable sales office on the C1028 Culloden Road last summer. After carrying out statutory consultations, Highland Council planners refused consent on December 17 – but almost a month later, the cabin is still in position. The planners say the cabin, intended to be in position for two years, changes the character of the area, but its impact will be temporary. Their main concern is the site’s visibility from the road and stopping sight distances. They have twice asked Kirkwood for speed surveys and have had no response. Kirkwood Homes said yesterday no one was available for comment. Irate local councillor Duncan Macpherson said anyone who flouts the law in this way should be charged double to resubmit their application. He said: “How could a big developer like Kirkwood Homes think they can flout planning laws like this? Chairman of Balloch Community Council Ian Williams said: “I think it’s an insult to the public and the council to just stick it there without planning permission. They know the rules. “They are trying to push the boundaries having established something and they think they can get away with it. Councillor Andrew Jarvie said: “This just points towards a fundamental attitude problem with Kirkwood homes and a callous disregard towards the battlefield site. Objector Patricia Robertson told planners she was highly concerned about Culloden Battlefield. She said: “How is it possible that a sacred and historic Scottish heritage site like Culloden Battlefield, do not get the respect they deserve.